For as long as I've had this blog (which surprisingly is almost a year although my post count wouldn't indicate it), I've had a domain name; actually longer. Although I did know that I could set up my blog to look like it belonged under my domain name, I had never looked into how to do it. Until today that is. Following the instructions I found here, I logged into my registrar's control panel and setup the CNAME as directed and then into my blog settings and set the domain name. The steps below are for my registrar, netfirms.ca, but as the instructions state, they should work roughly the same for any registrar. 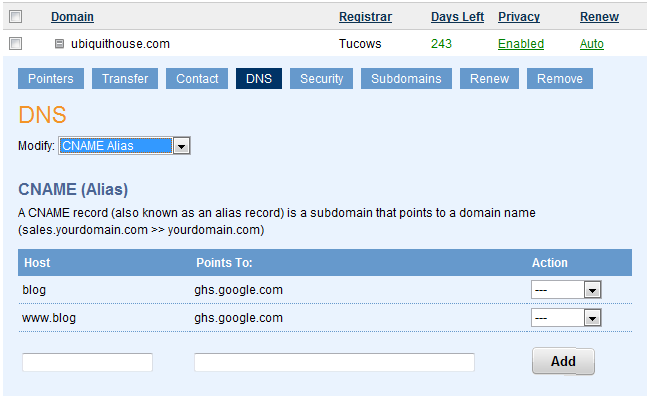 And obviously, if you use the hosting provided through Google, it should be even easier. in front of it. Adding the second entry made it work for me but your mileage may vary and this may not be required. And that's it. Give the DNS entries time to take; you'll know it worked when you navigate to your CNAME alias and get a Google 404 page. Once that happens edit the domain used for your blog as directed in the instructions and you're all set.